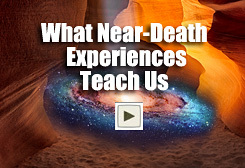 “Thousands of people have had near-death experiences, but scientists have argued that they are impossible. 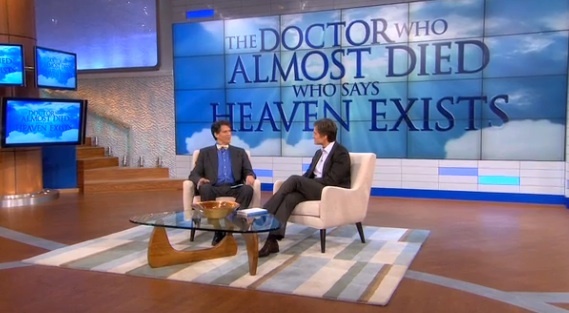 Dr. Eben Alexander was one of those scientists. A highly trained neurosurgeon, Alexander knew that NDEs feel real, but are simply fantasies produced by brains under extreme stress. “Then, Dr. Alexander’s own brain was attacked by a rare illness. The part of the brain that controls thought and emotion — and in essence makes us human — shut down completely. For seven days he lay in a coma. Then, as his doctors considered stopping treatment, Alexander’s eyes popped open. He had come back. “Alexander’s recovery is a medical miracle. But the real miracle of his story lies elsewhere. While his body lay in coma, Alexander journeyed beyond this world and encountered an angelic being who guided him into the deepest realms of super-physical existence. There he met, and spoke with, the Divine source of the universe itself. “Alexander’s story is not a fantasy. Before he underwent his journey, he could not reconcile his knowledge of neuroscience with any belief in heaven, God, or the soul. Today Alexander is a doctor who believes that true health can be achieved only when we realize that God and the soul are real and that death is not the end of personal existence but only a transition. “The author of the #1 New York Times bestseller Proof of Heaven teams up with the sages of times past, modern scientists, and with ordinary people who have had profound spiritual experiences to show the reality of heaven and our true identities as spiritual beings. 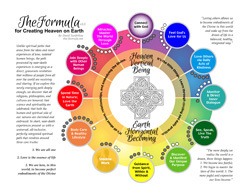 The Map of Heaven takes the broad view to reveal how modern science is on the verge of the most profound revolution in recorded history — all around the phenomenon of consciousness itself! “When Dr. Eben Alexander told the story of his near-death experience and his vivid journey to the other side, many readers wrote to say it resonated with them profoundly. Thanks to them, Dr. Alexander realized that sharing his story allowed people to rediscover what so many in ancient times knew: there is more to life, and the to the universe, than this single earthly life. “Dr. 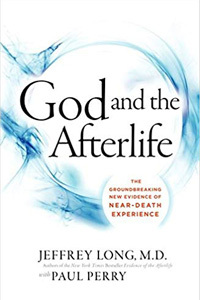 Alexander and his co-author Ptolemy Tompkins were surprised to see how often his readers’ visions of the afterlife synced up with each other and with those of the world’s spiritual leaders, as well as its philosophers and scientists. 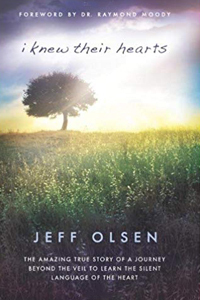 In The Map of Heaven, he shares the stories people have told him and shows how they are echoed both in the world’s faiths and in its latest scientific insights. It turns out there is much agreement, across time and terrain, about the journey of the soul and its survival beyond death. 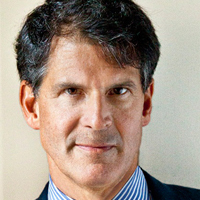 In 2008, Dr. Eben Alexander’s brain was severely damaged by a devastating case of bacterial meningitis, and he lapsed into a weeklong coma. 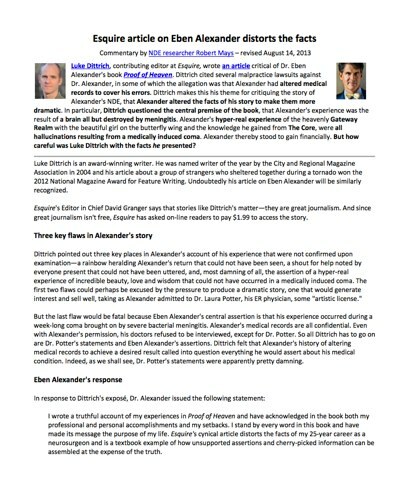 It was almost certainly a death sentence, but Dr. Alexander miraculously survived―and brought back with him an astounding story. 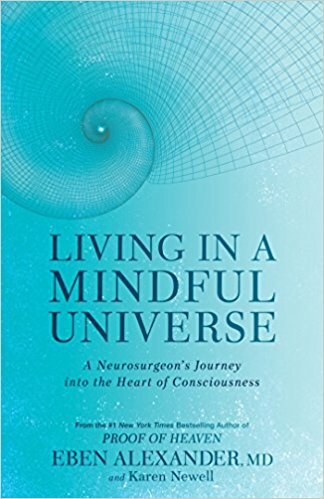 During those seven days in coma, he was plunged into the deepest realms of consciousness, and came to understand profound truths about the universe we inhabit. What he learned changed everything he knew about the brain, mind, and consciousness and drove him to ask a question confounding the entire scientific community: How do you explain the origins of consciousness if it is not a byproduct of the brain. His challenge relates to a revolutionary shift now underway within our modern scientific understanding. Ultimately, direct experience is key to fully understanding how we are all connected through the binding force of unconditional love and its unlimited power to heal. 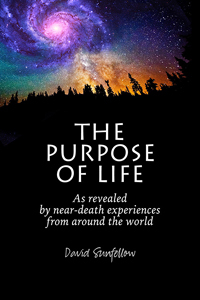 In Living in a Mindful Universe, the New York Times bestselling author of Proof of Heaven and The Map of Heaven shares his insights into the true nature of consciousness. Embracing his radically new worldview, he began a committed program of personal exploration into non-local consciousness. 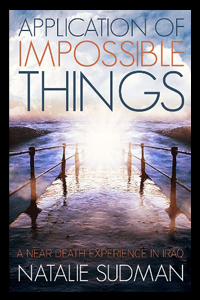 Along the way, he met Karen Newell, who had spent most of her lifetime living the worldview he had only just discovered was possible. Her personal knowledge came from testing various techniques and theories as part of her daily routine. With Living in a Mindful Universe, they share techniques that can be used to tap into our greater mind, and explore how the power of the heart can enhance healing, relationships, creativity, guidance, and more. Using various modalities related to meditation and mindfulness described herein, you too can gain the power to access that infinite source of knowing so vital to us all. 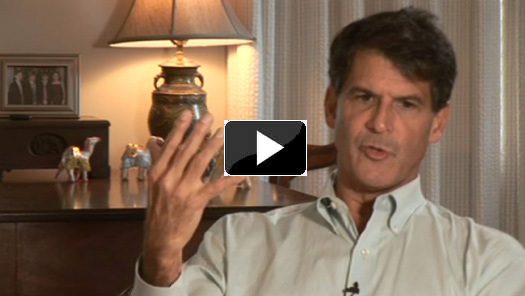 Eben Alexander, M.D., is the neurosurgeon who fell into a coma while suffering from bacterial meningitis. 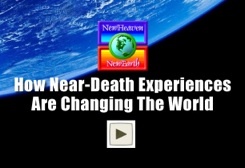 He claims to have had a transcendental Near-Death Experience (NDE), which allowed him a glimpse of heaven, as well as proof of the existence of God and the afterlife. He insists his experience was not a hallucination, as his brain was comatose and incapable of any activity. 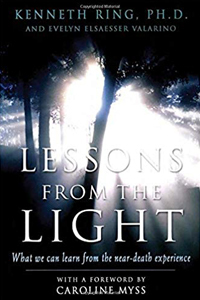 He wrote about his NDE in the book Proof of Heaven. His latest book is called The Map of Heaven, which touches on meditation and the path to transcendence. “It’s all about how the answers lie within us all,” he says. Alexander’s claims — and his own professional and personal history — are not without controversy, but that hasn’t stopped his book from climbing up the bestseller lists worldwide. MANUEL TEODORO: For the benefit of those in our audience that aren’t completely aware of your story… Run us through, Dr. Alexander, quickly what exactly happened and what the diagnosis was. EBEN ALEXANDER: Okay. It all came on very suddenly and I developed severe back pain, and headaches, and within 2-3 hours had grand mal seizures, was driven deep into coma and I was taken to the emergency room and at that point they determined that I had gram negative bacterial meningitis, which is really about the worst kind of bacterial meningitis you could have. In fact, I was extremely ill from this; my neocortex – the human part of the brain – the last sign of any kind of function of that neocortex was within an hour or so of hitting that emergency room, and from then on, my neocortex was gone. It’s something I came to realize in the months after my coma, trying to analyse and understand it, is that that kind of meningitis is the perfect model for human death, because meningitis attacks the surface of the brain, the outer surface of the neocortex is the part that makes us human. All of human conscious experience, according to conventional neuroscience, demands that that neocortex, or at least some part of that must be active. Everything we see, everything we hear, all of our emotions, falling in love, appreciating a beautiful symphony or sunset, every bit of that demands that the six-layer neocortex – the human part of the brain – be functioning. That’s why it was such a gift that I had a really flagrant case of meningitis that by all accounts should have killed me, and certainly should not have allowed for any rich, elaborate, ultra-real experience like I had deep in coma. MT: Allow me to ask you one really quick question – what were your religious beliefs before and how did heaven play into those beliefs before this happened? EA: Before this coma, I had grown up in a Methodist church in North Carolina, and my father was very religious. He had come from eastern Tennessee. He was very spiritual, he had grown up in the Baptist church but he was a neurosurgeon, in fact he was an academic neurosurgeon, and he was the chairman of a neurosurgical training program. So he was deeply into science, he was every bit science, but he also had a religious faith. So a lot of that rubbed off on me when I was younger. I wanted to believe what I’d heard in church. But like so many who had grown up in the 60s and 70s, I knew full well that science is the pathway to truth. And I’ll tell you, I am more of a scientist now than I’ve ever been in my life, and I realize that what is happening now is that science needs to greatly expand its boundaries to fully encompass the fundamental role of consciousness and acknowledge that the soul exists. MT: So it would be fair to say you were agnostic before? EA: Yes, for 8 years leading up to coma. And I think that’s important for people to understand. I went into my coma journey open-minded, but certainly not a believer. And my coma journey showed me very clearly that God and that the eternal realm of our eternal spiritual selves are much more real that this. “This” is dreamlike by comparison. And that realm is absolutely, fundamentally rock-solid, that’s our soul home. And that is the most beautiful thing. So in other words when our physical brain and body die, it actually liberates our conscious awareness up to that grander knowing and being, reuniting with our higher soul, reuniting with our soul mates, going through our life review… If we were handing out pain and suffering to others we have to relive that in our life review on behalf of our victims. In our words there is no need for an eternal hell, we have to go through that in a life review and feel it, feel the power of the emotional impact of our decisions and choices in life, the impact on others around us. MT: What are some of the fundamental – what would you call them, visions? – or aspects of that experience that you had that make you– that when you came back convinced you that you went to heaven? EA: In fact, for months after I came back, I was not convinced I’d gone to heaven. I knew something very shocking and completely – I mean shattering – had happened, that completely threw all my models of brain-mind consciousness and existence — threw all that out of the window. What had happened weeks after my coma, going back to my medical records, I had gone back to the hospital to talk to my doctors, my neurologists, neurosurgeons I had seen, went through the medical records, went through all my scans, and started realizing, hey wait a minute, this brain was way too sick, the neocortex was far too damaged to come up with anything and so when I first came back I was blown away by the experience, completely. I mean, it’s the most shocking thing you can imagine. But remember that I didn’t know anything. All my knowledge, my brain, my consciousness, had been stripped away during the journey by the meningitis. That’s how I explained it initially, severe bacterial meningitis destroys the neocortex, of course it would get rid of all prior experience and memory. So that part seemed to be no surprise. But the deeper I got into it the more I realized, well, I shouldn’t have had any experience at all! And my doctors were very keen to tell me, when I tried to tell them what had happened, well you can’t have experienced anything, your neocortex was badly damaged, in fact we had no idea how you’d come back. To this day they have no explanation as to why I had a full recovery, and I think that’s an essential thing to understand about this: that I went through a long process, and that’s what Proof of Heaven is all about. It shows how I tried to explain this, as a brain-based mechanism. I tried to explain this as some kind of a dream, a drug-affected confabulation, a trick of the dying brain. That’s what my doctors told me when I came back. And yet the more I went over my medical records and my experiences with my doctors, the more I came to realize that there is no way that this brain, so devastated by bacterial meningitis, could have manufactured any of that. It should have been a state of nothingness, with the near-destruction of my neocortex. And yet it was much more like the blinders coming off and an awakening to a far richer, more vibrant and alive reality than the one in this world. And that was the deep mystery that demanded some kind of explanation. MT: What is your message, Dr. Alexander, to the inevitable skeptics that maintain to this day that what you had were hallucinations, and that it just wasn’t heaven? EA: Well I would say that anyone who says that simply doesn’t know enough about gram negative bacterial meningitis. This is why you don’t have a lot of doctors out there coming out and saying, well, we see this now and then, and Dr. Alexander simply had a hallucination. If they know anything about the medical story, anything about gram negative bacterial meningitis, and about someone being driven into coma within 3 hours and spending 7 days in coma with that diagnosis, and know all the details of my medical illness, it was such a severe case there was really no way I could have had any kind of experience based on my neocortex and so that’s why the scientific world takes this story very seriously. So there’ll be plenty of skeptics – I would call them pseudo-skeptics, debunkers, deniers who simply won’t believe it no matter what. People who are addicted to scientific materialism as if it were the brain creating consciousness, and there are many people out there. I mean, I was exactly like that before my coma so I know exactly what that thinking is all about. But any pseudo-skeptic who puts it out there that this had to be a hallucination simply has not paid enough attention to the medical details of this case. MT: Can you describe a little bit of that coming back? What that phase was like? EA: Well the coming back was like… It was the hardest thing I can ever remember in all my existence. It was like climbing out of a gravel dirt pit where every move is just pulling and everything around you was – it was impossible to climb out of there and back into this world. And yet I knew I had to be strong, the sense of responsibility and love for that soul, for my 10-year-old son who again, I did not remember at the time, that I had to come back. So it was a tremendous struggle coming back to this world, it was all for the love for him that I had to. And when I first started waking up in that ICU, and was fighting the ventilator – they were pulling – they had finally pulled the tube out and all that – I remembered nothing of my life before. As I said before I remembered deeply everything I had been through in this coma journey and there were family members standing around and I had no idea who they were. MT: Do you as we speak believe that when you die, you will go to heaven? EA: All I know is that when I die, I will reunite with my higher soul to a much greater awareness. That’s probably the biggest shock for the skeptic when they die, is all of a sudden they come to this realization that not only are they still here, but they are far more aware than they ever were when they were incarnate in this physical form, and they they’ll reunite with their entire soul, soul mate, go through this life review and encounter than infinitely powerful deity that is pure love, to go back into that oneness of the core. And than plan that reincarnation to come back with the soul group to do it again and get it better. This is all about the essence of our soul group. And in fact all of humanity and beyond is part of this ascendance, this evolution of consciousness that is occurring. But each one of us is doing it on our own as part of that far grander evolution of consciousness. And that is something that will happen. 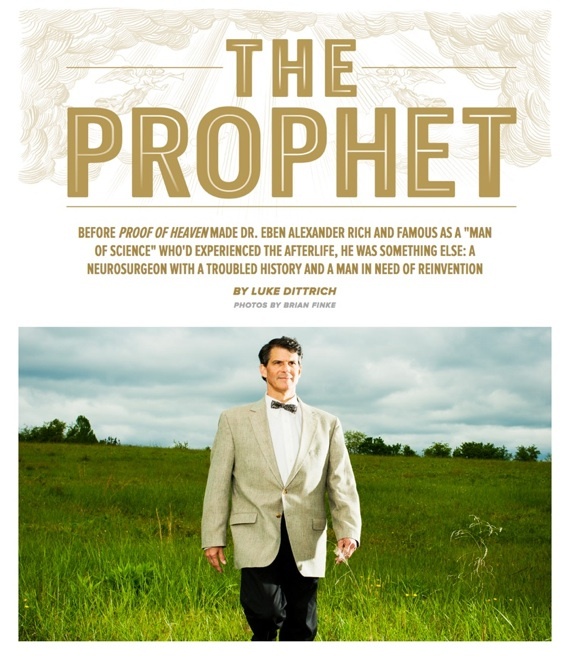 Esquire has published a critical article about Dr. Eben Alexander, his near-death experience, and best-selling book, “Proof of Heaven.” Among other things, the article describes a series of malpractice lawsuits from Dr. Alexander’s past (including one where he falsified medical records), and a long string of apparent inconsistencies in Alexander’s story. To read Esquire’s article, click here. To read a comprehensive summary of Esquire’s article that includes additional background information, videos, reader comments, and preliminary take-aways, go here. 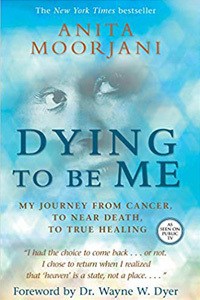 In this two-hour video, Dr. Eben Alexander describes his near-death experience to Dr. Raymond Moody, the father of the near-death experience movement. Then the two doctors spend time discussing near-death experiences in general, including such topics as the hard question of consciousness, how the soul and consciousness exist independent of the brain, quantum physics, the true nature of time, space, and reality, reincarnation, evil and injustice, the purpose of life, the purpose of challenges and difficulties in our lives, the importance of love, relationships, and learning, the importance of “doing the work” (not just reading books and attending conferences), the world being on the verge of a global awakening, the merging of science and spirituality, how modern resuscitation techniques are bringing back more and more people who report increasingly far-reaching and profound near-death experiences, and much more. 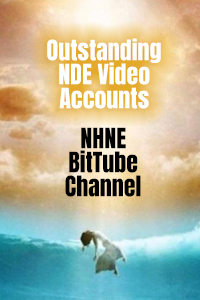 This is one of the best, most thorough video accounts that Dr. Alexander has given of his NDE to date. The cost to view this video is 7.99 per person. The video is located here. 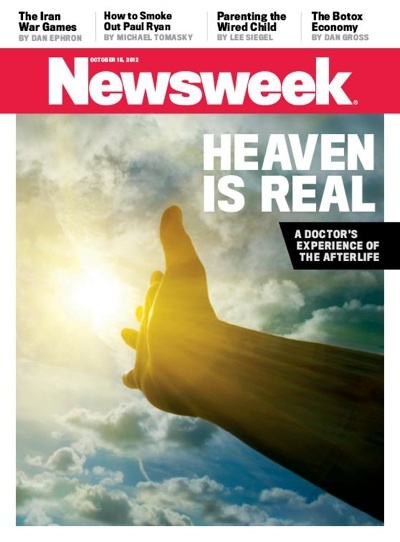 When leading neurosurgeon Dr. Eben Alexander found himself in a coma, he experienced things he never thought possible — exclusively excerpted from his upcoming book Proof of Heaven, he shares his journey to the afterlife in the October 15, 2012 issue of Newsweek. Newsweek coverage on The Daily Beast, Facebook, on Twitter, on Tumblr. Sam Harris: Proud And Prejudiced? Very early one morning four years ago, I awoke with an extremely intense headache. Within hours, my entire cortex — the part of the brain that controls thought and emotion and that in essence makes us human — had shut down. Doctors at Lynchburg General Hospital in Virginia, a hospital where I myself worked as a neurosurgeon, determined that I had somehow contracted a very rare bacterial meningitis that mostly attacks newborns. E. coli bacteria had penetrated my cerebrospinal fluid and were eating my brain. There is no scientific explanation for the fact that while my body lay in coma, my mind — my conscious, inner self — was alive and well. While the neurons of my cortex were stunned to complete inactivity by the bacteria that had attacked them, my brain-free consciousness journeyed to another, larger dimension of the universe: a dimension I’d never dreamed existed and which the old, pre-coma me would have been more than happy to explain was a simple impossibility. But that dimension, in rough outline, the same one described by countless subjects of near-death experiences and other mystical states, is there. It exists, and what I saw and learned there has placed me quite literally in a new world: a world where we are much more than our brains and bodies, and where death is not the end of consciousness but rather a chapter in a vast, and incalculably positive, journey. It took me months to come to terms with what happened to me. Not just the medical impossibility that I had been conscious during my coma, but more importantly, the things that happened during that time. Toward the beginning of my adventure, I was in a place of clouds. Big, puffy, pink-white ones that showed up sharply against the deep blue-black sky. A sound, huge and booming like a glorious chant, came down from above, and I wondered if the winged beings were producing it. Again, thinking about it later, it occurred to me that the joy of these creatures, as they soared along, was such that they had to make this noise; that if the joy didn’t come out of them this way then they would simply not otherwise be able to contain it. The sound was palpable and almost material, like a rain that you can feel on your skin but doesn’t get you wet. Seeing and hearing were not separate in this place where I now was. I could hear the visual beauty of the silvery bodies of those scintillating beings above, and I could see the surging, joyful perfection of what they sang. It seemed that you could not look at or listen to anything in this world without becoming a part of it; without joining with it in some mysterious way. Again, from my present perspective, I would suggest that you couldn’t look at anything in that world at all, for the word itself implies a separation that did not exist there. Everything was distinct, yet everything was also a part of everything else, like the rich and intermingled designs on a Persian carpet … or a butterfly’s wing. It gets stranger still. For most of my journey, someone else was with me. A woman. She was young, and I remember what she looked like in complete detail. She had high cheekbones and deep-blue eyes. Golden brown tresses framed her lovely face. When first I saw her, we were riding along together on an intricately patterned surface, which after a moment I recognized as the wing of a butterfly. In fact, millions of butterflies were all around us — vast fluttering waves of them, dipping down into the woods and coming back up around us again. It was a river of life and color, moving through the air. The woman’s outfit was simple, like a peasant’s, but its color — powder blue, indigo, and pastel orange-peach — had the same overwhelming, super-vivid aliveness that everything else had. She looked at me with a look that, if you saw it for five seconds, would make your whole life up to that point worth living, no matter what had happened in it so far. It was not a romantic look. It was not a look of friendship. It was a look that was somehow beyond all these, beyond all the different compartments of love we have down here on earth. It was something higher, holding all those other kinds of love within itself while at the same time being much bigger than all of them. Without using any words, she spoke to me. The message went through me like a wind, and I instantly understood that it was true. I knew so in the same way that I knew that the world around us was real was not some fantasy, passing and insubstantial. We will show you many things here, the woman said, again, without actually using these words but by driving their conceptual essence directly into me. But eventually, you will go back. Each time I silently put one of these questions out, the answer came instantly in an explosion of light, color, love, and beauty that blew through me like a crashing wave. What was important about these blasts was that they didn’t simply silence my questions by overwhelming them. They answered them, but in a way that bypassed language. Thoughts entered me directly. But it wasn’t thought like we experience on earth. It wasn’t vague, immaterial, or abstract. These thoughts were solid and immediate — ”hotter than fire and wetter than water” — and as I received them I was able to instantly and effortlessly understand concepts that would have taken me years to fully grasp in my earthly life. I continued moving forward and found myself entering an immense void, completely dark, infinite in size, yet also infinitely comforting. Pitch-black as it was, it was also brimming over with light: a light that seemed to come from a brilliant orb that I now sensed near me. The orb was a kind of interpreter between me and this vast presence surrounding me. It was as if I were being born into a larger world, and the universe itself was like a giant cosmic womb, and the orb (which I sensed was somehow connected with, or even identical to, the woman on the butterfly wing) was guiding me through it. I know full well how extraordinary, how frankly unbelievable, all this sounds. Had someone — even a doctor — told me a story like this in the old days, I would have been quite certain that they were under the spell of some delusion. But what happened to me was, far from being delusional, as real or more real than any event in my life. That includes my wedding day and the birth of my two sons. Modern physics tells us that the universe is a unity — that it is undivided. Though we seem to live in a world of separation and difference, physics tells us that beneath the surface, every object and event in the universe is completely woven up with every other object and event. There is no true separation. Before my experience these ideas were abstractions. Today they are realities. Not only is the universe defined by unity, it is also — I now know — defined by love. The universe as I experienced it in my coma is, I have come to see with both shock and joy, the same one that both Einstein and Jesus were speaking of in their (very) different ways. I’ve spent decades as a neurosurgeon at some of the most prestigious medical institutions in our country. I know that many of my peers hold — as I myself did — to the theory that the brain, and in particular the cortex, generates consciousness and that we live in a universe devoid of any kind of emotion, much less the unconditional love that I now know God and the universe have toward us. But that belief, that theory, now lies broken at our feet. What happened to me destroyed it, and I intend to spend the rest of my life investigating the true nature of consciousness and making the fact that we are more, much more, than our physical brains as clear as I can, both to my fellow scientists and to people at large. I learned this firsthand after I was well enough to get back out into the world and talk to others — people, that is, other than my long-suffering wife, Holley, and our two sons — about what had happened to me. The looks of polite disbelief, especially among my medical friends, soon made me realize what a task I would have getting people to understand the enormity of what I had seen and experienced that week while my brain was down. 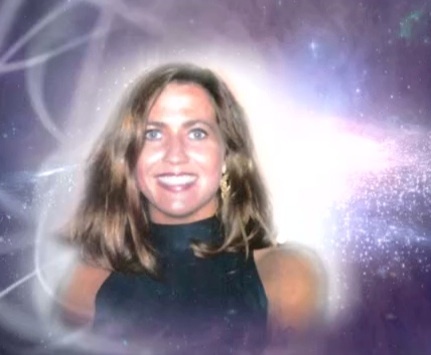 The photograph of Eben Alexander’s deceased sister, whom he had never met. 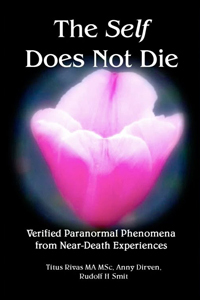 Alexander says she was the guardian angel he encountered during his NDE. An illustration of Alexander’s deceased sister as the guardian angel he encountered on the other side. To read her complete comments, which are very supportive of Eben’s overall story, go here.